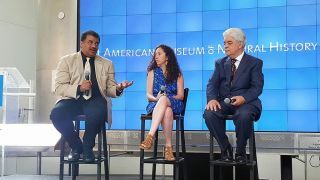 Astrophysicist Neil deGrasse Tyson, astronomer Jackie Faherty and FiOS1 meteorologist Joe Rao discussed the total solar eclipse of Aug. 21, 2017, at the American Museum of Natural History on Monday (Aug. 14). NEW YORK — Like millions of Americans, Neil deGrasse Tyson plans to watch the total solar eclipse on Aug. 21. But he's keeping his eclipse-viewing location a secret, the famous astrophysicist told reporters here at the American Museum of Natural History Monday (Aug. 14). "I will be in a place that is not disclosed," Tyson said at the briefing. "I am going into a media blackout during the eclipse." The eclipse has garnered enough publicity already, so it really doesn’t need any more hype from him, he added. Tyson, who is the director of the Hayden Planetarium at the American Museum of Natural History, is best known for his science talk show "StarTalk" and TV series "Cosmos: A Spacetime Odyssey." This year, he came out with a new book called "Astrophysics for People in a Hurry." While he hopes to avoid being pummeled with questions on the day of the eclipse, Tyson pointed out that he is, in fact, not the only eclipse-savvy astrophysicist around. For any burning eclipse questions, Tyson said, people should turn to local experts, like professors at community colleges and members of local science clubs. There are "tons of thousands of people who have sufficient expertise to tell the media anything they want about this eclipse," Tyson said, "and I will not be there. I will be in totality somewhere on Earth." Editor's note: Find out how the solar eclipse will look from your location — Space.com has teamed up with Simulation Curriculum to offer this awesome Eclipse Safari app to help you enjoy your eclipse experience. The free app is available for Apple and Android, and you can view it on the web. If you take an amazing photo of the Aug. 21 solar eclipse, let us know! Send photos and comments to spacephotos@space.com.